I believe most people agree that Sushi is the most famous Japanese food in the world. If you have had it, you feel the taste of Sushi Rice is sour and sweet. Also if you know the taste of regular steamed rice, you feel the difference of the taste obviously. Sushi Rice is called as “Sumeshi” in Japanese. It means rice and “Sushisu”. 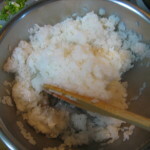 Sushi Rice is added rice vinegar to steamed rice. One of my friend in US says his family sometimes enjoy hand made sushi party in his home. I was surprised because ingredients including sushi rice is delivered from local sushi restaurant. If people remember hot to make sushi rice, those party will be more easy. So today, I will introduce how to make it. * “GOU” is a Japanese unit to measure the amount of rice or sake. 1) Steam rice with a little less water than regular steamed rice. Please refer previous post how to steam regular rice. With a less water, rice will be steamed harder. I used about 10% less water. 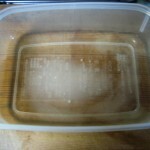 2) Mix rice vinegar, sugar and sea salt well. This is called as Sushisu (or Suhizu). 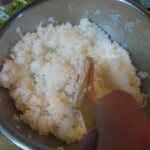 3) When rice is steamed, place it in a bowl. Then pour Sushisu on the rice. 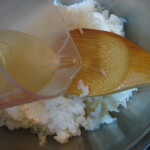 4) Stir rice and sushisu with rice scoop (shamoji) quickly and well. We call it as “stir like cut.” I think the following video will be good example. 5) After that, make it cool down. In Japan, we usually use the folding fan to cool down. 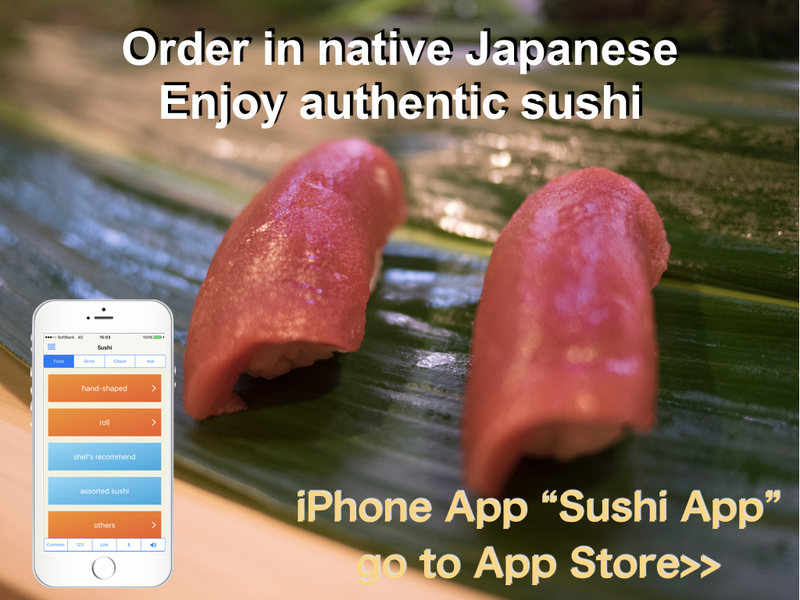 Once Sushi Rice is made, you can make any kind of sushi such as sushi roll, nigiri sushi, chirashi sushi etc. I made sushisu for 2 or 3 gou at this time. If it is remained, you can keep it for about one month in refrigerator. 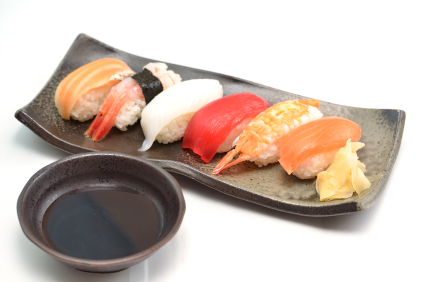 Sushi was originally a preservative food. In very very old time, it was made to combine fish, sea salt and steamed rice, and then leave it for long time (some are for many years). It is called as “Nare Sushi” and is very rare today. Sushi which we can see today is called as “Haya Sushi.” Nare Sushi is a kind of fermented food, so it taste sour. There are some story why vinegar is used for sumeshi. One story says the reason to keep it for long time because there was no refrigerator. Other one says that it adds sour taste like Nare sushi. I have never had Nare sushi. We can’t find it in the market. 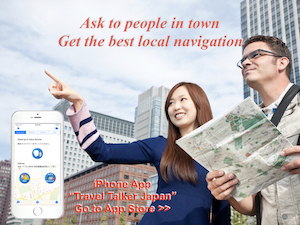 I heard that there is a Nare sushi with mackerel saury pike. It is fermented for 30 years! I want to try it in the future. I am happy if you try to make Sushi rice by yourself referring this article.